Cadia Engine House and the West Cadia Mines (North Section & South Section). Cadia Engine House – Its Significance and Conservation. East & West Cadia Properties, 1878. Plan of the Cadia Properties, 1878. Plan of Alluvial Works, East Cadia Property, 1880. Plan of the Cadia Properties, 1881. Plan of the Cadia Properties, 1881, detail of Village. 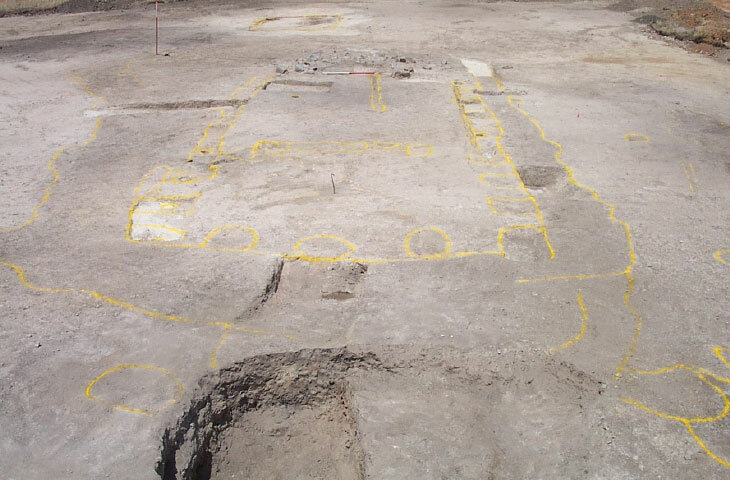 Cadia Village – archaeological investigations, 2002. Cadia Village – finding the buildings in the 1861 inventory. The Chaplain’s House or Underground Manager’s House (Site W001). Cadia Village – unexpected results from West Cadia Village. Cadia Village – the house that grew and grew. Cadia Village – Miners’ Huts. Cadia Village – The Bon Accord Hotel. Cadia Village – the Cadiangullong Store and the Old Village Centre. Artifacts, Assemblages and Life Paths. Cadia Cemetery. List of Burials and their Identification. Waringa Farm – the story of a Conditional Purchase. Plan of the second house, Waringa. Tunbridge Wells – a history of farm amalgamation. Amalgamation of Farms – Map. Amalgamation of Farms – Timeline. Te Anau Homestead – the Holman connection with Cadia continues to 1956. Sketch Plan of the homestead at Te Anau. Tynan’s Slaughterhouse – from farm to slaughterhouse. Wire Gully Gold Diggings and Farm. In July and October 1879, William Colman, farmer of Cadia, selected two portions of land, each of 100 acres, about 5 kilometres south of Cadia Village (Portions 248 and 251, Parish of Waldegrave). He paid the deposit under the Conditional Purchase regulations of the 1861 Robertson Land Acts. By September 1879 he had built a hut on this land, valued at £20. In 1881, William Colman married Sara Baker. Their first child was born in 1882. Four other children were born between 1884 and 1889. By 1882, Colman stated he had completed fencing, clearance and buildings to the value of £100. The Stock Return of 1884 listed William Colman as a landholder at Reedy Flat, with 200 acres, 3 horses, 10 cattle, no sheep and 8 pigs. On 23 November 1885, Conditional Purchase Inspector Langley surveyed Colman’s farm. He described it as “good agricultural land”. With his growing family, William Colman needed to build a larger house. In July 1886 he mortgaged his land to William Smyth Blood, storekeeper, for £80, but paid off the loan by December 1886. He next took out a larger loan for £150 from Patrick Kenna, hotelkeeper in Orange, in February 1887 to build his new house at a better location on his land. Unfortunately Colman was never able to pay off this loan and during the 1890s Depression was not even able to pay off the accumulating interest. He lost the land in 1902, but appears to have stayed in the area. Two of his children were married at Carcoar and Blayney in 1910. His wife died in 1918, her death registered at Carcoar. William Colman died in 1941, his death registered at Orange. With only limited resources available to him, William Colman had been able to raise his family, but had not succeeded in making his farm into an economically viable unit. 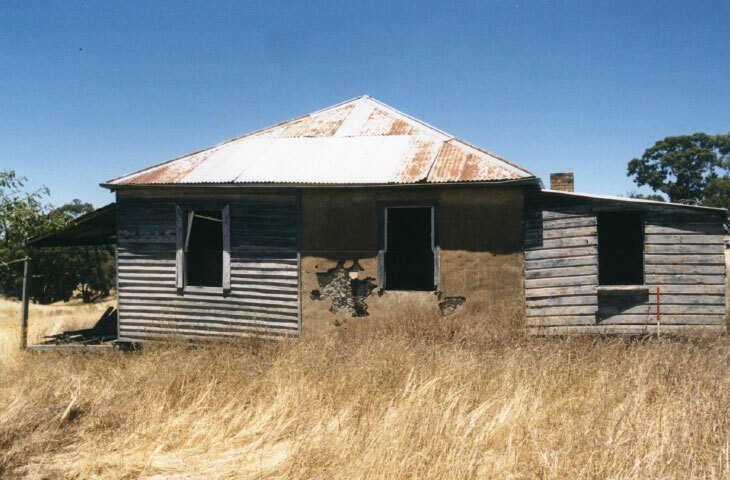 In 2003, the site of Colman’s first hut was excavated prior to mining expansion. The hut was indeed a simple two-roomed post-built wattle and daub hut. It had some further adornments, including a timber board floor and glazed windows. The dairy was located adjacent to the hut and a short distance away was a structure interpreted as a pigsty, next to the rubbish dumps for the household. Some of the land had been cultivated, as revealed by plough marks. The rubbish dumps provided an assemblage of artifacts, which reveals details of everyday life. The family lived comfortably and by comparing this assemblage with others at Cadia Village, it can be seen that the family were at the threshold where property ownership was a viable option. 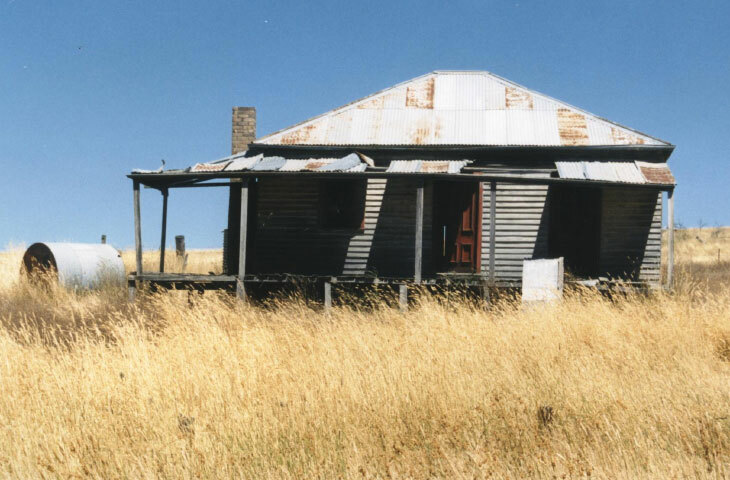 The second house, built by William Colman in 1886-1887 in a new location further south, was recorded in detail before it was demolished to make way for mining. The house had been constructed over three stages. The first stage built by Colman measured 8.8 by 3.8 metres (29 feet by 12 feet 8 inches) and was constructed using a timber frame, infilled with mud, held in place by chicken wire. Similar building techniques may have been used in Cadia Village, but were certainly used on neighbouring farms. Later extensions, carried out in the 1920s to 1940s added three rooms in a skillion at the rear and two larger rooms at the front, all in weatherboard, with a large verandah. In the dry conditions, yellow survey paint was used to mark the wall lines and post-holes of the hut. A rubbish pit is located in the foreground. At the opposite end of the hut, a scatter of stones reveals the original position of the fireplace (scale 1 metre) (Edward Higginbotham). The second house on Waringa, built by William Colman in 1886-1887. The original portion was constructed with a timber frame, but the panels were infilled with mud, held in place by chicken wire and given a final render of external plaster (Edward Higginbotham, 2001). The front of the second house on Waringa, extended in weatherboard during the 1920s-1940s (Edward Higginbotham, 2001). 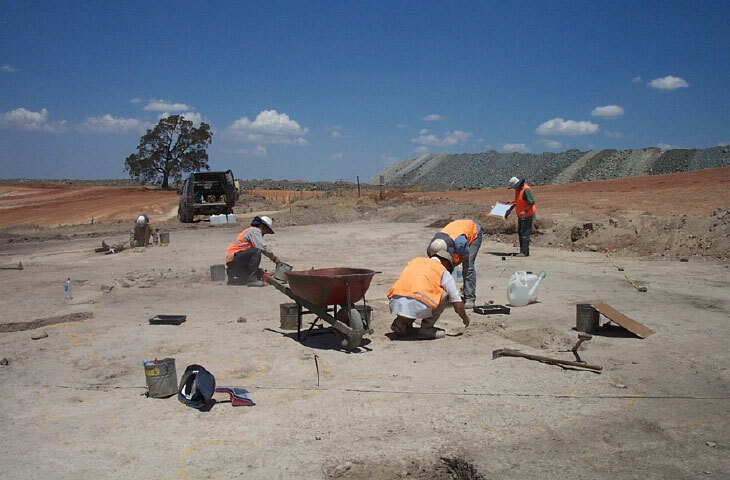 Excavations of Waringa Hut in progress in 2003 (Edward Higginbotham).